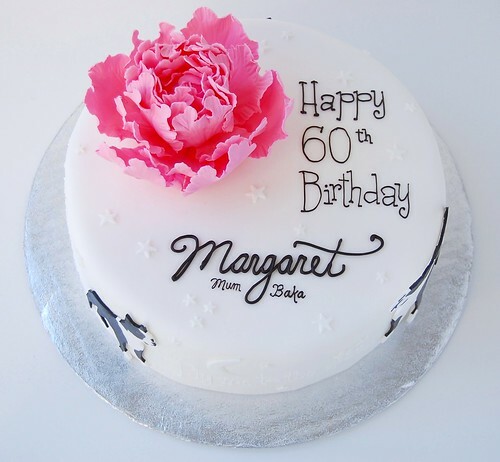 Back in July, during pleasant dinner conversation with my friend Chris, the seeds were sown for this special 60th birthday cake for his mum, Margaret. Apparently, Chris has unique gustatory abilities and had been dreaming up cake flavour combinations in his spare time. Pairing vanilla and black currant was his original idea but I felt the need for nuttiness, which would give warmth and texture. We ultimately decided on pistachio as the last component of this elegant flavour trio. The cake design was less definitive. Margaret loves her Boston Terrier and enjoys the music of Tony Bennett but I could not imagine the likenesses of Mr. Bennett and a dog on the same cake without appearing comical. And so, her favourite song "Fly Me to the Moon" provided the design inspiration for this sophisticated cake, worthy of celebrating six decades of memories. The Boston Terriers led me to choose a black and white colour scheme for this sleek and modern design, accented by one single pop of colour in the form of a sugar pink peony, Margaret's favourite flower. 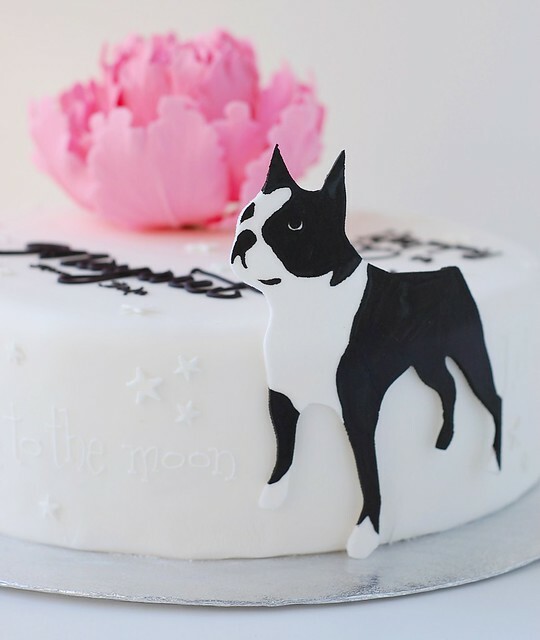 The subtleness of the white on white lettering, moon and stars allowed the dogs and birthday inscription to stand out. My favourite elements of this cake are impossible to choose. I love everything on it, from the dogs, to the hand-cut stars, to the gumpaste peony (the first one I've made), and even the lettering which is based on a font called Sparkly! Interestingly, I have now made cakes for three generations of this cake-loving family which is certainly a great privilege and the biggest compliment. 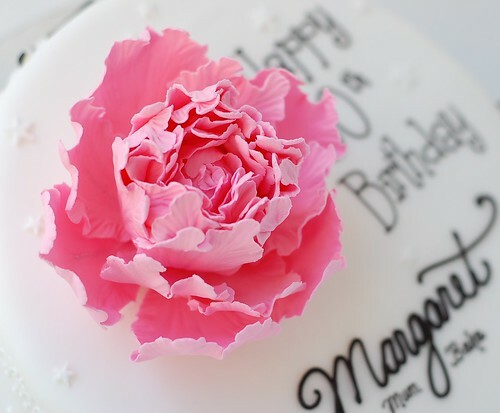 Happy Birthday Margaret! Posted by Charmaine at 3:07 p.m.
foarte elegant si sic, cool. September 13, 2010 at 10:46 p.m.
September 14, 2010 at 2:46 a.m. It is the most amazing cake! Simple colors, but so beautiful! so elegant, so beautiful. 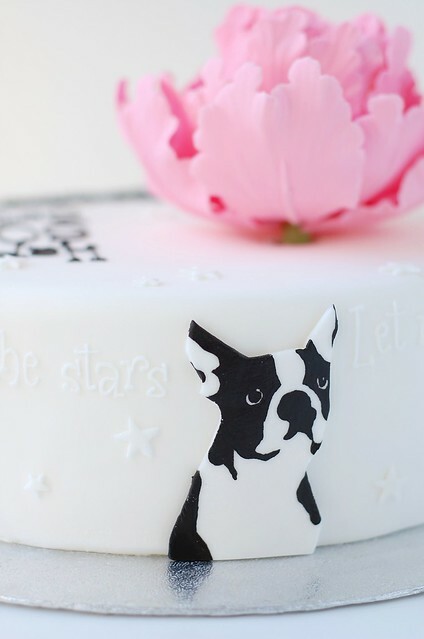 Is the Boston Terrier also gumpaste? Your work always blows me away, Charmaine. September 14, 2010 at 8:56 a.m.
Amanda: Dried fondant, hand painted. Thanks! September 14, 2010 at 9:06 a.m. Your creations are absolutely beautiful! 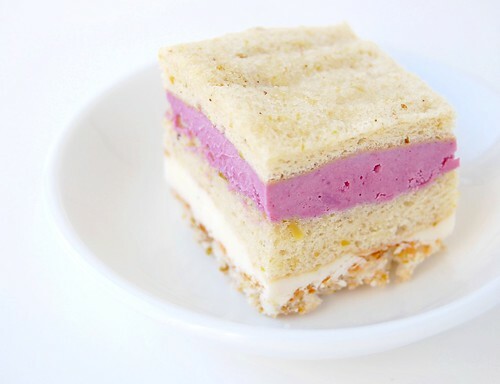 So glad I found your blog through foodgawker! September 14, 2010 at 7:14 p.m.
That is the most BEAUTIFUL cake inside and out. September 15, 2010 at 4:01 a.m.
You are seriously talented, way talented. Wow! September 15, 2010 at 6:17 a.m.
September 15, 2010 at 7:20 a.m.
September 17, 2010 at 3:33 a.m.
September 21, 2010 at 9:11 a.m.
Kayleigh: I think they were CelCakes. September 21, 2010 at 9:18 a.m.
September 21, 2010 at 9:22 a.m.
What a fabulous cake....love the design and all the decoration. October 8, 2010 at 7:36 p.m.
wow! your work is amazing! i have always admired someone who can do cake work like this! my sister led me to this blog and i am definetly glad! you are based out of bc? do you have a shop or just out of your home? October 13, 2010 at 4:04 p.m.
Brittany: Thanks! No shop, just from home in Vancouver. October 13, 2010 at 4:53 p.m. This is a beautiful cake. What a great idea and execution! October 22, 2010 at 5:03 p.m.
November 6, 2010 at 7:43 a.m. This cake is stunning! You handcrafted the designs beautifully and perfect. Wish I had hands like yours. I'm struggling real hard to get creative with my cake using fondant. I just really need to practice more! November 9, 2010 at 6:10 p.m.
November 13, 2010 at 1:01 p.m.
Wow all around! All your work is so beautiful and I love everything about this cake! June 29, 2011 at 3:51 a.m.